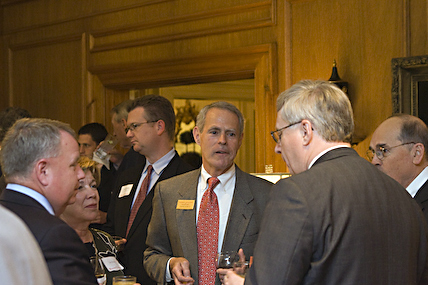 The St. Louis Association of Wabash Men welcomed President and Mrs. Pat White, along with Dean for Advancement Joe Emmick '92, to St. Louis on May 15, 2008. The reception and dinner was held at the beautiful Old Warson Country Club. After the reception and a great dinner, Trustee Tom Hays '55 introduced President and Mrs. White to the group. Pat White then talked about his experiences thus far at Wabash. Pat's remarks centered on Wabash's students and the efforts of the College's developing Strategic Plan to further strengthen the learning experiences these men will encounter. Pat then engaged in a lively question and answer session with alumni, parents, and friends of the College. Many thanks to Tom and Sue Hays. Tom and Sue hosted the reception and dinner and made all the arrangements with the Old Warson Country Club.